For Prelims: Vote- on- account and Full budget- features and differences. For Mains: Why cant’s an outgoing present a full budget- issues involved and need for clear guidelines on this. Context: On February 1, the government is set to present its last Budget ahead of the elections. Conventionally, a government at the end of its term has gone in for a vote on account rather than a full Budget. Therefore, experts are divided over the issue. While few are in favour of a full budget, others oppose it on the ground that this is an election year and the government has already presented 5 full budgets. Article 266 of the Constitution of India mandates that Parliamentary approval is required to draw money from the Consolidated Fund of India. Besides, Article 114 (3) of the Constitution stipulates that no amount can be withdrawn from the Consolidated Fund without the enactment of a law (appropriation bill). What is a vote on account? A vote on account essentially means that the government seeks the approval of Parliament for meeting expenditure — paying salaries, ongoing programmes in various sectors etc — with no changes in the taxation structure, until a new government takes over and presents a full Budget that is revised for the full fiscal. Why present a vote on account? The reasoning is that there is little time to get approvals from Parliament for various grants to ministries and departments, and to debate these as well as any provisions for changes in taxation. More importantly, the reasoning is that it would be the prerogative of the new government to signal its policy direction, which is often reflected in the Budget. The vote-on-account is normally valid for two months but full budget is valid for 12 months (a financial year). An Interim Budget is not the same as a ‘Vote on Account’. While a ‘Vote on Account’ deals only with the expenditure side of the government’s budget, an Interim Budget is a complete set of accounts, including both expenditure and receipts. An Interim Budget gives the complete financial statement, very similar to a full Budget. For Prelims and Mains: Institutes of Eminence Scheme- features and significance. Context: The University Grants Commission has deferred a decision on which institutions should be granted the prestigious Institutes of Eminence tag as an expert committee has recommended more names than the government scheme allowed for. The empowered expert committee headed by former Chief Election Commissioner N. Gopalaswami had initially recommended 11 institutions for the tag in July 2018. In December, the committee recommended 19 more names, taking the total list to 30. The institutes of eminence scheme under the Union human resource development (HRD) ministry aims to project Indian institutes to global recognition. The selected institutes will enjoy complete academic and administrative autonomy. The government will run 10 of these and they will receive special funding. The selection shall be made through challenge method mode by the Empowered Expert Committee constituted for the purpose. Eligibility: Only higher education institutions currently placed in the top 500 of global rankings or top 50 of the National Institutional Ranking Framework (NIRF) are eligible to apply for the eminence tag. The private Institutions of Eminence can also come up as greenfield ventures provided the sponsoring organisation submits a convincing perspective plan for 15 years. Mains Question: The union government is seeking to change the bad situation in higher education sector by establishing world-class “institutions of eminence” around the country. How can India build such institutions? What should be the nature of these institutions? Examine. For Prelims and Mains: FMCG sector- overview, key facts and schemes related. Context: The fast moving consumer goods (FMCG) industry is expected to clock double digit growth in the current year, though the growth is likely to be lower than that of the previous year, which saw the sector benefit from the overall health of the economy and lower inflation. Consumption growth in 2018 was led by favourable macros like growth in GDP, lower inflation and manufacturers passing on the benefits of margin expansion from the GST regime. Fast-moving consumer goods (FMCG) sector is the 4th largest sector in the Indian economy with Household and Personal Care accounting for 50% of FMCG sales in India. Growing awareness, easier access and changing lifestyles have been the key growth drivers for the sector. The government has allowed 100% Foreign Direct Investment (FDI) in food processing and single-brand retail and 51% in multi-brand retail. This would bolster employment and supply chains, and also provide high visibility for FMCG brands in organised retail markets, bolstering consumer spending and encouraging more product launches. Consumer Protection Bill with special emphasis on setting up an extensive mechanism to ensure simple, speedy, accessible, affordable and timely delivery of justice to consumers. The Goods and Services Tax (GST) is beneficial for the FMCG industry as many of the FMCG products such as Soap, Toothpaste and Hair oil now come under 18 per cent tax bracket against the previous 23-24 per cent rate. The GST is expected to transform logistics in the FMCG sector into a modern and efficient model as all major corporations are remodeling their operations into larger logistics and warehousing. 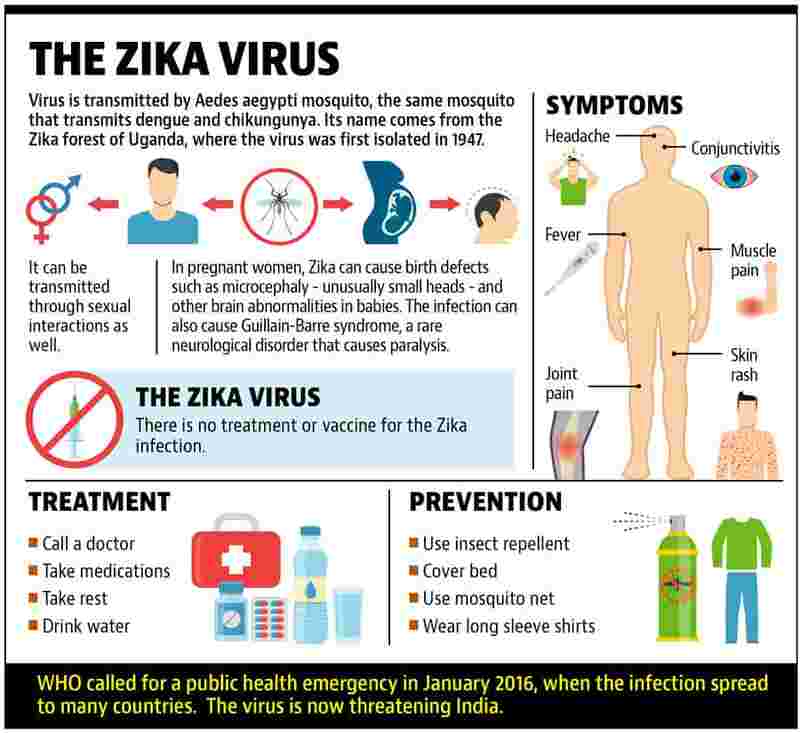 For Prelims and Mains: Zika- virus, symptoms and spread, Is India prepared to face such outbreaks? Context: According to a recent study by National Institute of Virology, Zika virus that infected 159 people in an outbreak in Rajasthan last year, could have been circulating in India for several years and is endemic to Asia. The finding that the outbreak was caused by an endemic virus is quite important. It suggests that people in the region may have been previously exposed to the virus, building herd immunity that may limit future outbreaks. It also states that the strain of virus found in India is different from that found in Brazil. While this is good news, because it implies that a portion of the population could be immune, it could also mean that Zika-related birth defects such as microcephaly were occurring even before the virus was first detected in India. Why India should be worried about Zika outbreak? Limited knowledge about epidemiological characteristics of virus and its interaction with other arboviruses, such as dengue. Limited lab capacity and cross reactivity of diagnostic flavivirus antibody assays. Absence of population immunity. High mobility of population and cross-border movement of travellers with infections. Favourable breeding conditions for Aedes mosquitoes and our inability to control mosquito breeding in the past for dengue. Underfunded and inadequate infrastructure in healthcare system in India resulting in inadequate outbreak control response. Establish access to a qualified diagnostic laboratory. Regular vector surveillance and integrated vector management (IVM). Health education for community mobilization. Inter-sector convergence and Co-ordination with International agencies. Is India prepared for disease outbreaks? Over the last decade, the Indian government has strengthened the surveillance and response system for catching disease outbreaks early. India may have improved its disease surveillance network, but reducing and limiting disease outbreaks requires several other measures, many lying outside the scope of the healthcare system. Can the country bring the large number of private practitioners into the disease surveillance network? Will the government increase its investment on healthcare, and bring them on a par with countries that have a good healthcare system? Will India improve its ability to quickly develop vaccines from scratch? Will research institutions and public health officials improve their health risk communication? Mains Question: Write a note on the Zika virus outbreak, its causes, consequences and the role of the government in dealing with this outbreak. Government policies and their performances. e-technology in the aid of farmers. For Prelims and Mains: Key features and significance of the project. Context: The ICAR has recently launched Rs 1100 crore ambitious National Agricultural Higher Education Project (NAHEP). Aim: To attract talent and strengthen higher agricultural education in the country. Funded by the World Bank and the Indian Government on a 50:50 basis. The objective of the NAHEP for India is to support participating agricultural universities and ICAR in providing more relevant and higher quality education to Agricultural University students. In addition, a four year degree in Agriculture, Horticulture, Fisheries and Forestry has been declared a professional degree. Conservation and pollution related issues. For Prelims: NCAP- features and targets. For Mains: Significance, challenges in its implementation and measures needed to improve its outcomes. Context: There are 139 Indian cities that breach air pollution standards but are not included in the Centre’s National Clean Air Programme (NCAP), says a report by Greenpeace. Airpocalypse III, as the Greenpeace report is titled, analyses air pollution data of 313 cities and towns for the year 2017. Of these 313 cities, 241 (77%) had PM10 levels beyond the National Ambient Air Quality Standards (NAAQS). These specify upper limits to a range of airborne chemicals and compounds. While 102 of these cities were included in the NCAP, the remaining 139 cities were left out. That’s because the government’s list of 102 cities relied on average pollution data until 2015, whereas Airpocalypse III used data updated up to 2017. Even if the NCAP were able to reduce pollution by 30% by 2024, 153 cities would still be left with pollution levels exceeding the NAAQS. Of the 139 cities that have not been included in the non-attainment list under the NCAP, there are several cities that have a population of more than 1 million, and PM levels (recorded in 2017) above NAAQS. These include: Ranchi, Dhanbad (Jharkhand); Jabalpur (Madhya Pradesh); Chennai, Madurai (Tamil Nadu); Meerut (Uttar Pradesh); Pimpri-Chindwar, Thane, (Maharashtra); Surat, Rajkot, Vadodara (Gujarat); and Howrah (West Bengal). The government, earlier this month, announced the National Clean Air Programme (NCAP). This is the first ever effort in the country to frame a national framework for air quality management with a time-bound reduction target. The programme will not be notified under the Environment Protection Act or any other Act to create a firm mandate with a strong legal back up for cities and regions to implement NCAP in a time bound manner for effective reduction. Achieve a national-level target of 20-30% reduction of PM2.5 and PM10 concentration by between 2017 and 2024. Central Pollution Control Board (CPCB) will execute this nation-wide programme in consonance with the section 162 (b) of the Air (Prevention and Control of Pollution) Act, 1986. The programme has been launched with an initial budget of ₹300 crore for the first two years. The plan includes 102 non-attainment cities, across 23 states and Union territories, which were identified by Central Pollution Control Board (CPCB) on the basis of their ambient air quality data between 2011 and 2015. Non-attainment cities are those which have been consistently showing poorer air quality than the National Ambient Air Quality Standards. These include Delhi, Varanasi, Bhopal, Kolkata, Noida, Muzaffarpur, and Mumbai. As part of the programme, the Centre also plans to scale up the air quality monitoring network across India. At least 4,000 monitors are needed across the country, instead of the existing 101 real-time air quality (AQ) monitors, according to an analysis. The plan proposes a three-tier system, including real-time physical data collection, data archiving, and an action trigger system in all 102 cities, besides extensive plantation plans, research on clean-technologies, landscaping of major arterial roads, and stringent industrial standards. It also proposes state-level plans of e-mobility in the two-wheeler sector, rapid augmentation of charging infrastructure, stringent implementation of BS-VI norms, boosting public transportation system, and adoption of third-party audits for polluting industries. Various committees: The national plan has proposed setting up an apex committee under environment minister, a steering committee under-secretary (environment) and a monitoring committee under a joint secretary. There would be project monitoring committees at the state-level with scientists and trained personnel. Why in News? Renault-Nissan has signed a pact with National Skill Development Corporation to train its workforce in the alliance plant in Chennai for future technologies. NSDC would assist the Renault-Nissan workforce develop competency standards in emerging manufacturing technologies. National Skill Development Corporation India (NSDC), established in 2009, is a not- for- profit company set up by the Ministry of Finance. NSDC was set up by Ministry of Finance as Public Private Partnership (PPP) model. The Government of India through Ministry of Skill Development & Entrepreneurship (MSDE) holds 49% of the share capital of NSDC, while the private sector has the balance 51% of the share capital. NSDC aims to promote skill development by catalyzing creation of large, quality and for-profit vocational institutions. It also provides funding to build scalable and profitable vocational training initiatives. Its mandate is also to enable support system which focuses on quality assurance, information systems and train the trainer academies either directly or through partnerships. It also develops appropriate models to enhance, support and coordinate private sector initiatives. Why in News? Eight organisations of the Chakma community have submitted a memorandum to the Ministry of Home Affairs seeking the inclusion of Chin refugees in India by further amending the Citizenship (Amendment) Bill, 2016. The Chins are one of the major ethnic groups in Myanmar, and are mostly Christians. 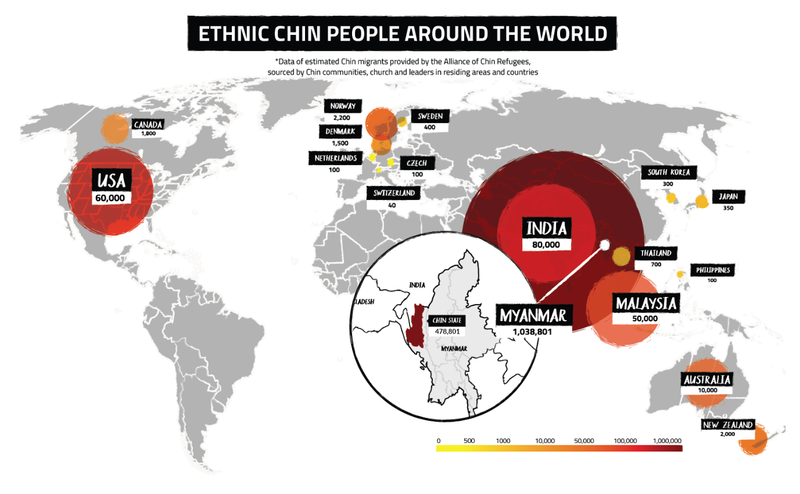 The number of Chin refugees in India is at least 1.2 lakh. There are an estimated 100,000 Chins in Mizoram, which is 20% of the total Chin population in Myanmar. Manipur too has an unspecified number of Chins, who are ethnically related to the majority Mizos of Mizoram and the Kuki-Zomi groups in Manipur. Context: The government of Uttar Pradesh has approved the construction of the Ganga Expressway. The 600km long expressway would be the longest expressway in the world. The expressway will provide for better connectivity of the Prayagraj (Allahabad) to Western Pradesh. Context: Assam has announced the success of the Golden Langur Conservation Breeding Programme in the State. The golden langur conservation project was undertaken at the Assam State Zoo in Guwahati during the 2011-12 fiscal. The golden langur (Trachypithecus geei) is currently endangered. Apart from a 60 square mile area in north-western Assam, small populations are found in Bhutan and Tripura. Though economy is doing well, human development as a whole is not up to the expected levels in the country. Here, the country continues to be compared with countries in Sub-Saharan Africa. Need of the hour: India’s economic growth must trickle down much faster to people at the bottom of the pyramid: to poorer farmers, landless rural labour, and hundreds of millions of workers living on the edge in low-paying, ‘flexible’ forms of employment with no social security. Solution: Economists seem to be offering three solutions to the economy’s structural problems. One, that there is no problem. Two, more privatisation. And, three, a universal basic income (UBI) to be provided by the state. UBI has appeared as a silver bullet solution to all the problems that the country is facing on the economy side. It will be an income provided to everybody by the very state that the capitalists say should get out of their way, and to whom they are unwilling to pay more taxes. The beauty of a ‘universal’ basic income, its proponents say, is that it avoids messy political questions about who deserves assistance. It also side-steps the challenge of actually providing the services required: education, health, food, etc. Just give the people cash: let them buy what they need. However, if the cash will not provide citizens with good quality and affordable education and health, because neither the government nor the private sector is able or willing to, this will not solve the basic human development problems that must be solved. What about QUBRI (quasi-universal basic rural income)? To make UBI financially and politically feasible, few economists have suggested a QUBRI (quasi-universal basic rural income), targeted only at poorer people in the rural areas. Their scheme is no longer universal. First, it will exclude the not-so-poor in rural areas as morally it should. Political questions about who should be included will have to be addressed. Second, it will not cover the masses of urban poor working for low and uncertain wages. Therefore, a simplistic UBI will not solve the fundamental problems of the economy. A better solution to structural inequality than UBI is universal basic capital, or UBC, which has begun to pop up in international policy circles. In this alternative approach, people own the wealth they generate as shareholders of their collective enterprises. Amul, SEWA, Grameen, and others have shown a way. Some economists go further and also propose a ‘dividend’ for all citizens, by providing them a share of initial public offerings on the stock market, especially from companies that use ‘public assets’, such as publicly funded research, or environmental resources. One, focus on building state capacity beginning with implementation of the recommendations of the Second Administrative Reforms Commission. Two, strengthen the missing middle-level institutions for aggregation of tiny enterprises and representation of workers. Three, the creativity of economists could be better applied to developing ideas for UBC than UBI.